With great respect and humility, the memory of the victims of the genocide of the Hellenes of Pontos, Anatolia and eastern Thrace was honoured in the Parliament of New South Wales, on Wednesday 19 June. The Pontian associations of NSW – Pontoxeniteas, Panayia Soumela and Diogenes (Wollongong) – combined their forces to honour the memory of their ancestors as well as those who moved the recent resolutions of recognition in the state parliament of New South Wales. The NSW Parliament passed two unanimous motions in May this year, recognising the Assyrian and Greek genocides, and reaffirming its 1997 motion recognising the Armenian genocide. All political parties were represented at the commemoration evening in the parliament, while also present in great number were leaders of the Hellenic, Armenian, Assyrian and Jewish communities, as well as directors of the Australian Institute for Holocaust and Genocide Studies. The Consul-General of the Hellenic Republic, Mr Vasileios Tolios and the Consul, Mrs Dora Toumanidou-Toliou were joined by representatives of the Central Pontian Community of Melbourne, the Panayia Soumela Foundation, the Euxeinos Pontos Association, the Pontian Society of Whittlesea Panayia Soumela, the Αkrites of Pontos and Return to Anatolia, as well as the Pontian Brotherhood of South Australia and the Pontian Brotherhood of Canberra. 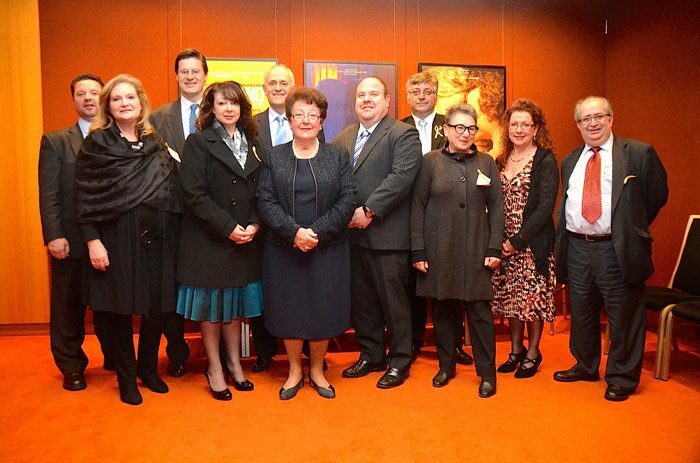 Amongst the community organisations represented were the Pan-Macedonian Association of NSW, the Order of AHEPA, the Australian Hellenic Educators’ Association of NSW, and the Organisation of Greek and Greek Cypriot Women. In her political address, the parliament’s sole indigenous Australian member the Hon Lynda Burney MP drew parallels between the experiences of indigenous Australians and the Hellenes of Anatolia. Ms Burney emphasised the significance of memory – both collective and individual. In a small gesture of Australian Hellenism’s gratitude towards the members of Parliament – who unanimously supported twin resolutions of recognition of the genocides of the Hellenes and Assyrians – plaques and icons of Our Lady of Mount Mela were presented to Premier Barry O’Farrell MP and to the Leader of the Opposition, John Robertson. “In the same way, education is the only answer to the problem of genocide in the 21st century world. In Australia, a key is the incorporation of the stories of the genocides of the Hellenes, Armenians and Assyrians within the Australian education system,” Diamadis said. A team of educators is currently developing programs for the Australian curriculum which specifically incorporate genocidal experiences. The sponsor of the resolution in the Legislative Assembly, Rev. Fred Nile MLC was also presented with a plaque. Following the commemoration, Rev. Nile addressed the NSW Upper House, speaking about the commemoration and delivering a solemn tribute to Australian ANZAC soldiers who witnessed and provided relief efforts during the genocides of the Armenian, Greek and Assyrian population of the Ottoman Empire. Nile’s message comes after Turkey’s Foreign Ministry has threatened to ban those Australian politicians who supported recent motions to recognise these genocides from attending Gallipoli commemorations of ANZAC Day in 2015. In his speech on the floor of the Legislative Council, Nile called upon Turkey to have respect for Australian history and to recognise the crime of genocide perpetrated by the Ottoman Empire. “Modern Turkey and modern Australia must have a friendship that is based on mutual respect and understanding of historical differences. Turkey and Australia have overcome the legacy of the battles on Gallipoli, so we must overcome whatever difference of opinion we have about recent motions recognising the Assyrian and Hellenic genocides and reaffirming the Armenian genocide,” Nile said.